Ana M. Thomas is among the finalists for the Hispanic Chamber of Commerce of Palm Beach County’s annual Esperanza Award. Thomas, Foundation development director and Palm Beach State College alumna, is nominated in the education category for her significant impact to her profession and the community. Other award categories are business and community. The awards luncheon will be held at 11:30 a.m. June 13 at the Hilton Palm Beach Airport. Tania Rogers, WPTV’s News Channel 5 reporter and anchor, will serve as the emcee. Social worker and journalist Marcela Gomez of the American Consulting and Social Service League will be the keynote speaker. Thomas is among four nominees in the category. Others are Elizabeth Cayson of Children Services Council, Mabel Datena of Hispanic Human Resources Council and Sandra Medrano-Arroyo of the School District of Palm Beach County. Thomas has more than 20 years of diversified experience planning and executing compelling fundraising programs that have generated significant awareness, organizational recognition, increased revenue and more. While at PBSC, she has directed and implemented corporate and Foundation-related fundraising activities generating up to $1.5 million in revenue and in-kind support annually; developed and implemented marketing strategies for the Foundation, including event marketing and a branding campaign; and directed and managed public relations initiatives for the Foundation to build awareness of fundraising programs, among others. 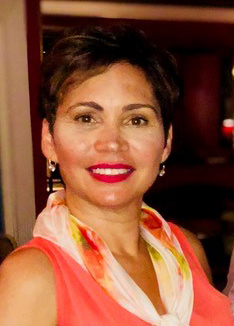 She is also a member of the Northern Palm Beach County Chamber of Commerce, Florida Immigration Coalition and Puerto Rican/Hispanic Chamber of Commerce of Palm Beach County. Thomas, a certified fundraising professional, received a bachelor’s degree in mass communications from the University of South Florida and an associate in arts degree at PBSC. Congratulations, Ana…so proud of you! Congratulations Ana Thomas. Indeed it is a well deserved recognition. We are Panther proud of you! Congratulations Ana. Thank you for your dedication to PBSC and the communities we serve. Congratulations Ana and lots of blessings for your future.